Needless to say after the big move to West Virginia things were pretty hectic. We also had a lot of unforeseen family issues to deal with so we didn’t get a lot of stuff done on the homestead and I didn’t get to post. While we are still pretty busy, due to our impending graduation, I did have the opportunity to do a fun project this past week. Before heading north to school I had found the time to collect a small bag of black walnuts which needed to be husked. A friend and I decided to use these husks to dye some clothing. My friend had a white skirt and shirt that she wanted to dye and I had found a pair of brand new, bright white work pants in a free box for Scott that desperately needed some color. 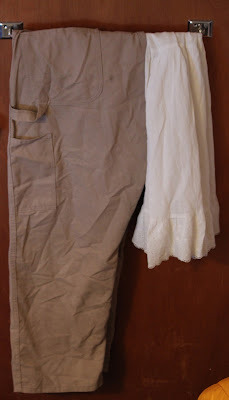 Why anyone would make white work pants is beyond me (update from Scotty: painter’s pants, duh!). 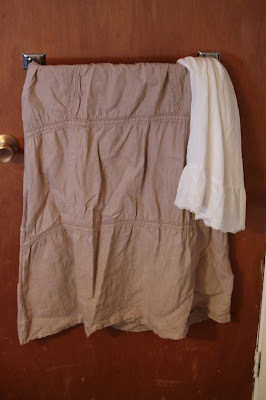 Black walnut dye is possibly the easiest natural dye I have ever used and it came out great. All we did was husk the walnuts (take off the green fruit part on the outside) and then boiled the husks for about one hour. After that we added our clothing, simmered them in the dye for another hour and then left them to soak overnight. When we removed our clothing we thoroughly rinsed them in the sink and then machine washed them. That’s it! Pretty easy huh? The pants and skirt with a white cloth next to them for comparison. 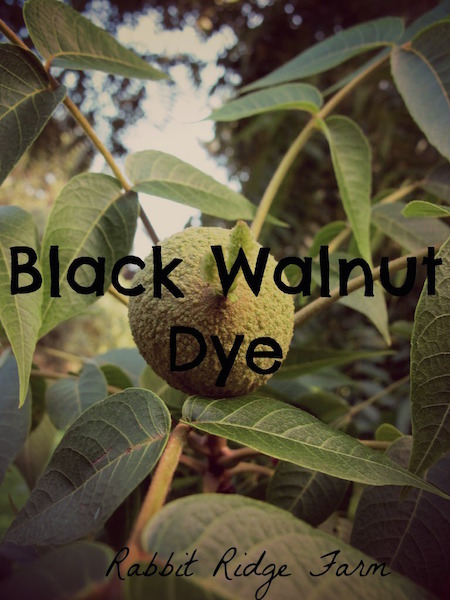 Black walnuts make a great dye on almost everything. Don’t wear anything you don’t want stained while husking walnuts and if you don’t want your hands to stay brown for a few days I suggest wearing gloves. We decided to strain out most of the big pieces of husk from the dye pot before adding the clothing so they would be easier to clean in the end. In order to get the full effect we kept the big pieces in a colander which we sat in the dye pot on top of the clothes kind of like a giant tea bag. Clothing that is light colored and made of a natural material like cotton or linen will take the die much better than one with polyester included. Expect your clothing to be about a shade lighter than it looks when it’s in the dye pot. We chose to save our dye in jars. It will last a long time and you can dye more clothing with it or if you decide you want your clothing to be a darker shade you can boil it again. One Response to "Black Walnut Dye"
Pingback: What the Heck is Needle Felting?